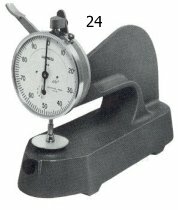 Same as model 240 but with indicator equipped to take deal load weight and having the proper contact pressure to meet ASTM, TAPPI, Federal, Underwriters or user's specs for checking a specific compressible material. 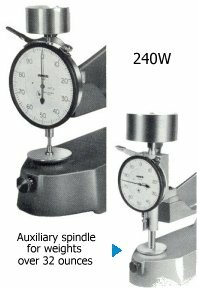 If weight must be greater than 32 ounces, gage can be furnished with auxiliary spindle and heavy duty lifting lever to support weight, thus achieving proper pressure without strain on the indicator. When ordering specify weight load and contact shape and size. 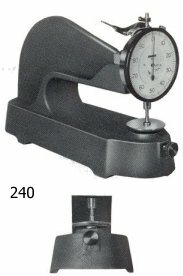 The heavy duty workhorse of Ames thickness comparators. Designed for millwork and other severe requirements. Ideal for checking extrusions, sheet metal, wallboard, etc. Has jumbo size Indicator and rugged lifting lever. Other design features similar to Model 240. Can be equipped with weights for extra heavy gaging pressure. .
Indicator : - Model 240 only - Any Ames model having .001", .0005" or .0001" grad value (or equivalent metric values) and plain, jeweled, shockless or jeweled shockless movement with .250 to 1.00" range. Model 24-1.00" range. Contacts : - Flat end or other diameter button or roller contact. Accessories : - Dust guard (240 only). Other : - Greater throat depth - 12", 18" & 24".